Good news! Interest rates are the lowest they’ve been since April 2018 – which makes it a great time for homebuyers to make a purchase. If you’re thinking about buying a home, you should know that interest rates can dramatically impact how much you pay for your home over the lifetime of your mortgage. 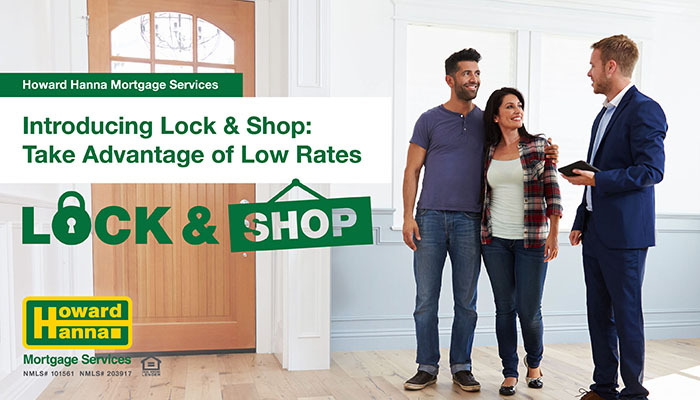 Our new Lock & Shop program can help you “lock in” these lower rates – then shop for your new home. The National Association of Realtors (NAR) and other major players across the industry expect mortgage interest rates to rise in 2019. That’s because the economy is anticipated to grow, and because financial markets tend to raise interest rates in a strong economy. Typically, you need a purchase contract before you can lock in an interest rate on your mortgage. With our new Lock & Shop program, you can get rate protection for up to 75 days! You’ll have 30 days* to find a home and execute a sales agreement, then you can use the remaining term of the lock to close on your property. There’s another reason to use Lock & Shop, too: Mortgage pre-approval may help give you an advantage when buying a home. As we’ve explored previously, being pre-approved for a mortgage may make all the difference in a seller’s market or in a bidding war. When you use Lock & Shop, you’ll know that you’re pre-approved for a mortgage at a specific rate. It helps you manage your homebuying budget – and helps your offer stand out to sellers. For more information about our Lock & Shop program, get in touch with your Howard Hanna real estate agent and mortgage loan originator, or visit Howard Hanna Mortgage. *Fully executed Sales Agreement must be provided to Howard Hanna Mortgage within 30 days of rate lock or lock is void. Loan must close within 75 days of the rate lock. Other product restrictions apply. NMLS: 101561 & 203917. Howard Hanna Real Estate Services is not a mortgage lender. Contact Howard Hanna Mortgage Services for mortgage products & eligibility. Offer of credit is subject to credit approval. Howard Hanna Mortgage Services is licensed by: The Pennsylvania Department of Banking and Securities. The Ohio Department of Commerce – Division of Financial Institutions. The Michigan Department of Licensing and Regulatory Affairs, Office of Financial and Insurance Regulation. Contact a Howard Hanna Mortgage Loan Originator for full details. PA (800) 474-4437, 1000 Gamma Drive – Pittsburgh, PA 15238. OH and MI – (800) 589-1118, 6000 Parkland Blvd. – Mayfield Hts, OH 44124. mortgage@howardhanna.com.